Time travel is possible. We witnessed it last week on the first-ever ShipHop Cruise. Sailing with Vanilla Ice, Salt-N-Pepa, Sisqo, Coolio, Kid-N-Play and other '90s icons, old school hip hop fans were transported back to their favorite decade with four nights of concerts, meet-and-greets, dress-up parties and themed events that ran the gamut from a cooking class led by Coolio to a "Win a Date with Salt" competition. There were even a few surprises -- including that time Vanilla Ice got on Carnival Sensation's intercom and invited everyone to a spontaneous beach party (more on that later). If this sounds like your kind of vacation, we've rounded up a few ways the ShipHop Cruise takes you back to the '90s, based on our sailing from Miami to Key West and Cozumel. Note: Although a second ShipHop Cruise is not yet on the books, the artists have hinted it's on -- and it's going to be all that and a bag of chips. If you missed out on the opportunity to see your favorite artists live, back in the day, the ShipHop Cruise is your chance. Concerts are held throughout the day and every night, on the pool deck and in the ship's main theater. 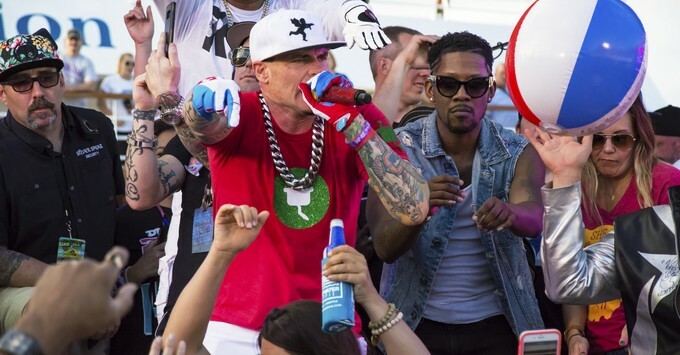 On our cruise, the entertainment kicked off with a sailaway party hosted by Vanilla Ice -- complete with dancing Ninja Turtles. The most nostalgic shows took place in the main theater, where fans gathered in front of the stage in a respectful 'mosh pit' and music videos played on the background screen during most artists' performances. In addition to Vanilla Ice, Salt-N-Pepa, Sisqo, Coolio and Kid-N-Play, the lineup on our cruise included Blackstreet, Naughty by Nature, Color Me Badd, All4One, Young MC, Tone Loc, Biz Markie, Rob Base and host Downtown Julie Brown. 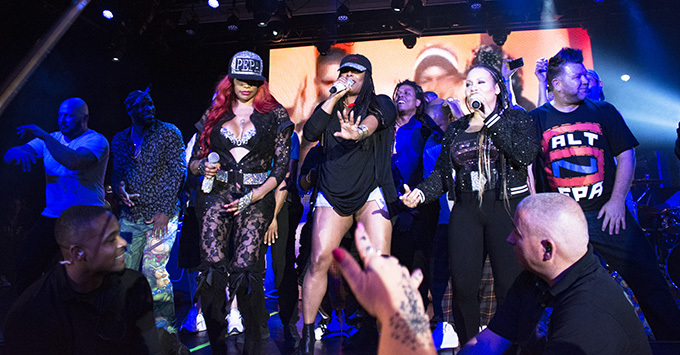 While there was no crowd surfing, members of the audience occasionally were invited to come up and dance on stage with the artists. Be still, our '90s fan child heart! Outside scheduled shows, top DJs kept the jams rolling on the pool deck and in the atrium. There was never a moment when '90s music wasn't playing in the ship's entertainment areas (except maybe when they slipped in a few early 2000s songs). First of all, we need to point out that all the activities onboard are free (unlike other theme cruises that charge extra for things like meet-and-greets and photo opps). 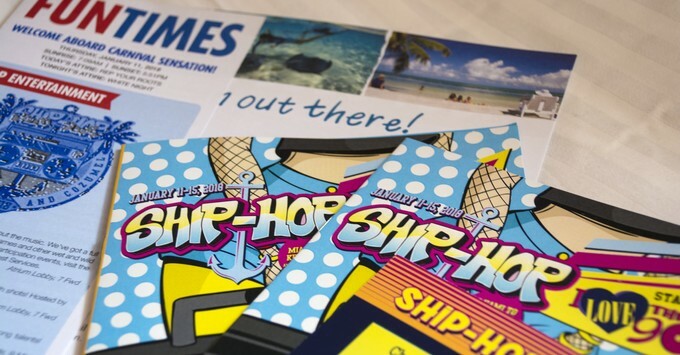 Passengers receive a ShipHop-branded, "Fun Times" Carnival agenda each day, which includes a breakdown of themed activities and offerings as well as standard Carnival programming such as trivia and spa specials. Also highlighted is a ShipHop drink of the day, which -- on our cruise -- included a Gangsta's Berry Paradise and Funky Cold Margarita. We found that the jam-packed schedule and variety, combined with the fact that ShipHop activities were complimentary, allowed passengers to handpick the shows and events they wished to attend, and come and go as they pleased. Most activities were hosted by the artists themselves, which gave fans another opportunity to plan their schedules around their favorites. Among the activities on our cruise were a Cooking with Coolio demo, a Win a Date with Salt competition, a Drunk Spelling Bee led by Salt-N-Pepa's Pepa and DJ Spinderella, ShipHop Yoga on the pool deck with Salt and the Salt-N-Pepa Shakers, and a hip-hop dance class. Of course, there's always room for surprises that aren't part of the cruise programming -- especially if Vanilla Ice is onboard. On our cruise, that meant a spontaneous beach (er, block) party at Cozumel's Paradise Beach, where he broke out retro boom boxes, put on a little show and treated his fans to countless rounds of tequila shots. The best part about the added exposure was that by day two, after the initial "star struck" feeling had faded, fans felt like they developed more personal connections with the artists. It wasn't out of the ordinary to see fans and artists chatting and snapping selfies together in the hallways or at the buffet. On top of the programming, each night featured a special theme -- including Rollin' With the Jammies, where passengers were encouraged to don retro slumber party attire, and a '90s Prom Night, where there was no shortage of puffy sleeves, crimped side-ponytails and tiaras. Diehards even went beyond the theme nights, rocking the '90s look throughout the duration of the cruise. We boarded the ship fully expecting (and welcoming) a "booze cruise" atmosphere, which is typical on shorter itineraries. We were wrong. The ShipHop Cruise felt less like a spring break party and more like a high school reunion with old friends. There was an overwhelming sense of comradery among the fans, which we attribute to the shared nostalgia and love of all things '90s. We expect a lot of fans from the first cruise back on the next one. Until then… word to your mother.